Businesses can be reviewed and rated on a whole host of websites like Google, Yelp, TripAdvisor, Zillow, BBB, and Angie’s List, to name a few. Businesses want to receive positive customer reviews because reviews add credibility to a business and what they offer their customers, and can impact a potential customer’s buying decision. And on Google specifically, your number of received reviews and average star rating can impact your Google My Business listing’s organic ranking compared to similar businesses in your area. If you are an individual, you might wonder how you can ask for and receive this same type of feedback from co-workers or customers you’ve worked for. Enter: Recommendations on LinkedIn. 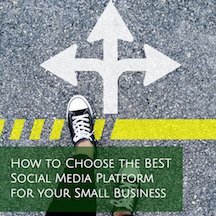 Note: If you are a small business owner or solopreneur, you can benefit from both types of reviews. 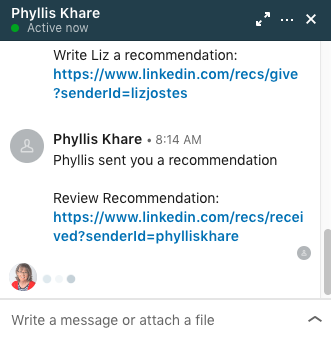 You can request a Recommendation from a LinkedIn Connection in one of two places: From a Connection’s LinkedIn Profile, or by scrolling down to the Recommendations section on your own LinkedIn Profile. 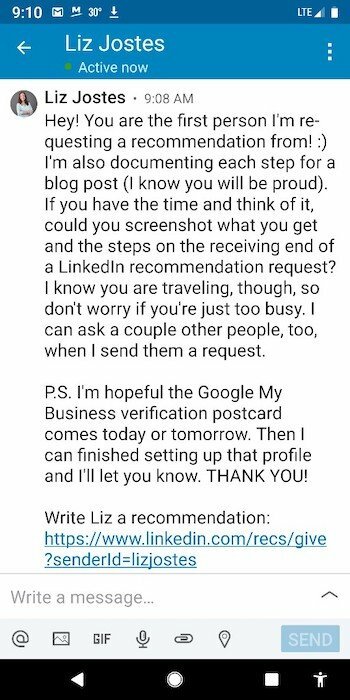 Here’s the process of requesting a LinkedIn Recommendation by visiting a Connection’s Profile. First, click on the More link located underneath their name and headline. Then select “Request a Recommendation” from the drop-down menu. Next, select how you two know each other, which provides some context to the future LinkedIn Recommendation. You’ll need to choose from the list of positions you’ve included on your LinkedIn Profile. 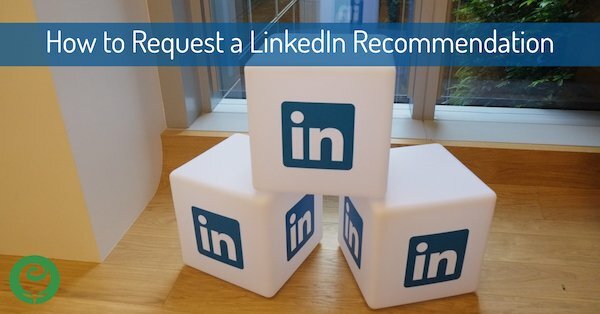 If you haven’t added the position to your LinkedIn Profile, visit your Profile and add it to your Experience section before requesting the Recommendation. Write a personal message to accompany your LinkedIn Recommendation request. It’s a big favor to ask of busy co-workers and clients, so a personal note will greatly increase the chances they’ll complete your request. Don’t hesitate to mention what kinds of skills or experience of yours they can speak to, especially if it’s been a while since you’ve worked together. Make sure you thank them for writing you this Recommendation, too. 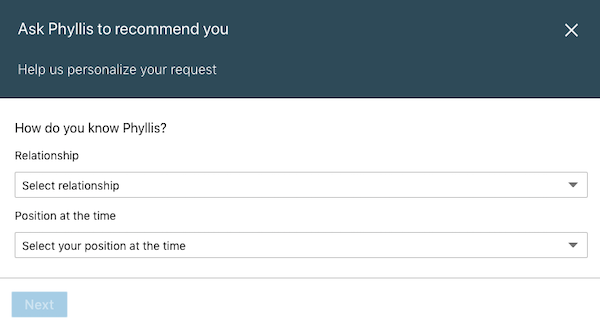 Before you make your first Recommendation request, you may want to know how this request comes to your Connections. 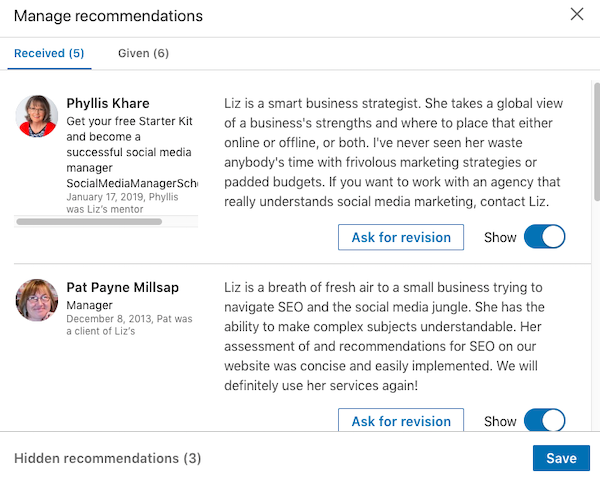 Here’s what the LinkedIn Recommendation request process looks like from your Connection’s side of things. Note: These next few screenshots are from the mobile experience vs desktop. 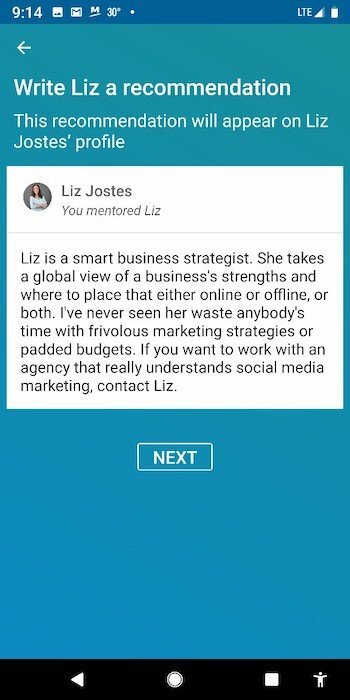 Your Connection can see your name, profile photo, and current LinkedIn headline, and first few lines of your message. At this point, your Connection can choose to Delete the request or Recommend you. Your Connection will click on the link included in the message to get started. 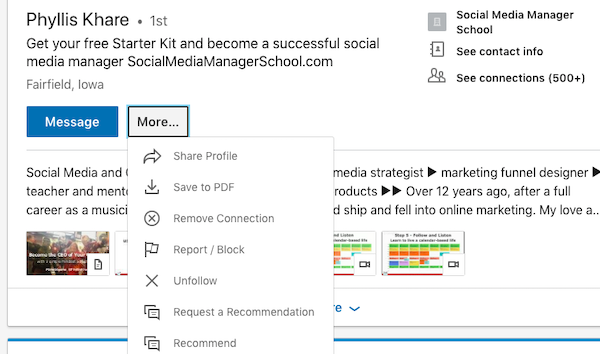 Your LinkedIn Connection will type his or her Recommendation into the field provided, and once done, the completed Recommendation will be sent to you for approval and publishing on your Profile. Once you receive notification of your new pending Recommendation, click on the link to review it. 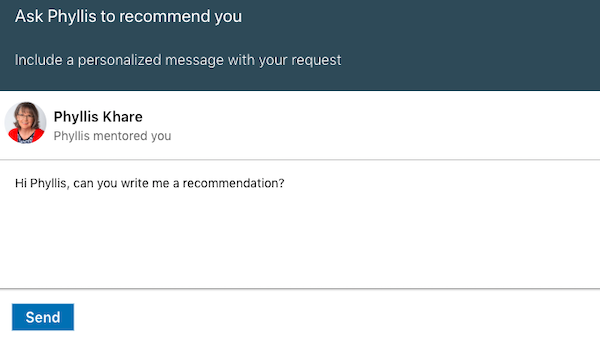 Once your Connection completes your requested Recommendation, you have the choice to dismiss it, approve and post it as is, or request an edit. Tread lightly when asking for revisions. Only do so if there’s a mistake in the information (e.g. a former co-worker mentioned the wrong job title that you had) or a typo. 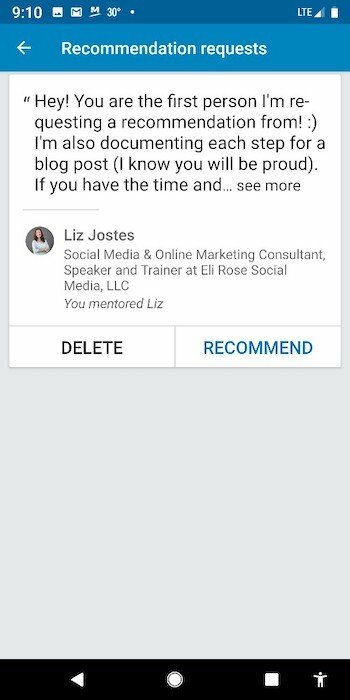 Once your new Recommendation is live on your Profile, you can view it and any others you’ve received by scrolling down to that section of your LinkedIn Profile page. You can also hide any already-published Recommendations that may not be applicable anymore (e.g. you changed fields or began a new career that’s very different from your last).